Technology Planning and its proper integration in education are more essential today than any other time in the evolution of teaching and learning for the 21st century. Technology Planning to ensure proper technology integration in education is more essential today than at any other time in the evolution of teaching and learning for the 21st century. Although technology costs have decreased over time, there are so many hardware and software choices today that it becomes even more important to plan for appropriate technology uses and integration into classroom instruction. In order to ensure proper use and to avoid wasting resources, teachers and students should be given opportunities to provide input during the technology planning process. According to the National Center for Education Statistics, the overall goal of technology policies and plans is the successful integration of technology to support student learning and school management. As most educators know, it is important to understand what it is that he or she wishes to accomplish; planning with this concept in mind will certainly help achieve a person’s goal. Any good planning involves all stakeholders in the process, therefore administrators, teachers and students should be consulted before any major decision to purchase a technology in support of instruction or management is made. When a school district staff begins the process of trying to develop an approach to the integration of a specific technology, they often miss the connection between the district’s mission and goals and how the technology can support it. Another problem is that districts rush into a rollout of a specific technology without sufficient thought being given to the infrastructure that actually supports it or even the fact that it will take preparation in terms of identification of the goal and how it aligns with the district vision for education. Training of staff members is also essential to ensuring the proper adoption of the technology. If a district rushes to either become like a neighboring district who has successfully implemented technology into instruction or to just get on the same bandwagon that is the latest technology trend, an adoption without appropriate planning is a direct path to failure. Surely, no one would invest in something that would be underutilized or not supported by the staff or students, for fear that the community would see it as spending taxpayer dollars foolishly. A wasted venture into an unsuccessful implementation of a specific technology would take many years to overcome. Building back trust with teachers or students or a community of taxpayers is not an easy mistake to reverse and it could set a district back years in terms of building back trust in any new initiatives specifically those involving technology. Technology will truly reinvent education and transform instruction to meet the needs of every student by creating a level playing field that allows every child to achieve success. The US Department of Education, Office of Educational Technology, states, “technology can be a powerful tool for transforming learning. It can help affirm and advance relationships between educators and students, reinvent our approaches to learning and collaboration, shrink long-standing equity and accessibility gaps, and adapt learning experiences to meet the needs of all learners.” This is something worth reflecting upon and putting in front of every stakeholder involved in technology planning, so that they are constantly reminded of what is hoped to be accomplished through adequate technology planning. One cannot forget how such a powerful tool could transform education and yet meet the many goals one might have within such a comprehensive vision. More importantly, technology will truly reinvent education and transform instruction to meet the needs of every student by creating a level playing field that allows every child to achieve success. Hassan, Amena. (2014, February). Case Study: The Metamorphosis of a Practice. Reston, Virginia. American College of Radiology (ACR). 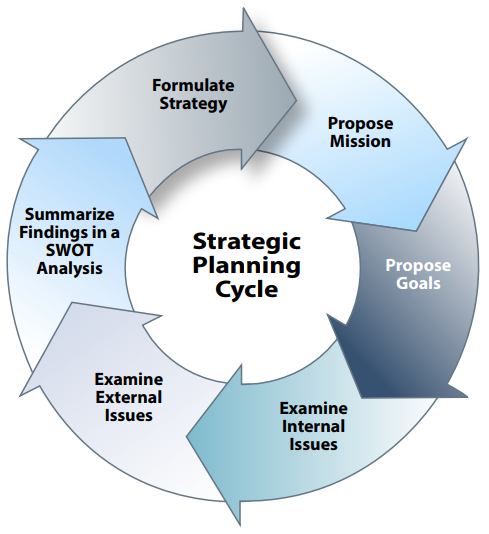 In summary, let’s take a look at the specific steps in the Strategic Planning Cycle to elaborate on this planning process. Understand the mission of the school district. There was some time spent by stakeholders to formulate a mission statement that depicts the purpose of the school district. Tie this mission to this effort. Propose goals that align with the vision to ensure targets are assessed, and measure progress. Examine carefully any internal obstacles that might have to be addressed before undertaking any technology implementation. Internally, one must examine the infrastructure of the district to ensure that it can support the effort. Also, it is important to assess the staff and student’s readiness for the technology. Provide professional development where needed to help with a successful implementation. One might have to think about providing technical support within your school structure to help with issues that might come along. Address external issues that need to be addressed. This might entail the readiness of the school community to support such an initiative. Often times community support is overlooked and the taxpayers do not understand what it is that you wish to accomplish. The effort to invest in technology could be viewed as frivolous by certain taxpayers, if you do not connect the investment with your vision, goals and specific outcomes. One might target a specific issue he or she wishes to address, i.e., increase graduation rates, improve student performance on state assessments, improve student attendance, etc. Identify the district’s strengths, weaknesses, opportunities and threats that might sabotage your effort and decrease your chances for a successful implementation. It is essential to think about these things before encountering them along the way, and is better to be prepared than sorry in the end. The time spent on planning in the beginning will save time in the end by responding to issues that could be avoided by carefully analyzing the process of implementation. Formulate a strategy to address the issues and move the idea forward. Working with all stakeholders will ensure that the effort is worth the time and putting success within reach. Time spent initially in planning for an implementation of technology will allow one to fully understand the complexity of a technology adoption and will be invaluable to the success of future initiatives that are technology based or not. One will build confidence in his or her ability toward successful transitions, as the school district continues to flourish in this ever-changing world of technology!